Add or improve the sound on your boat with our marine audio packages as well as a full range of marine speakers, marine subwoofers, marine amplifiers, and marine source units. We carry products from the top brands in the both the marine and mobile audio industry including JL Audio, Rockford Fosgate, Kicker, Wet Sounds, Infinity, Stinger, and Boss. Whether your boat is brand new or new-to-you, let us help you get some better sound in there. We have everything from simple head unit and 2 speaker packages to full-blown, loudest boat on the water packages. Take the guess work out of your boat's stereo system with our marine audio packages. We offer our boat stereo systems with or without a head unit and they start in either 2 or 4 speaker packages. We also offer you the option to add aditional speakers or wake tower speakers. We have packaged everything together by brand to help ensure that everything matches up perfectly. Choose between 6.5" or 8" speakers, add a couple subwoofers if you want, choose your amp, add a head unit if you need one, a remote if you need one, and you should be ready to party! If you want sound on your boat, you're going to need speakers! Our wide selection of marine grade speakers are designed to withstand the elements, both salt and UV. We offer marine grade speakers ranging in size from 4" all the way up to massive 10" speakers from Wet Sounds. Most marine grade speakers are designed for infinity baffle, or free-air use, so you don't need to worry about air space or enclosing them in a box. We also offer a wide range of speakers with LED lights integrated into the grille. These have become very popular and each brand does it a little bit differently, but they add a nice touch, especially if you are out on the water at night. Add a subwoofer to your boat's stereo system to get the best sound quality possible when on the water. With outdoor applications, the bass from the speakers can get lost because you are not in an enclosed environment with walls or windows like your living room or in your car. Adding a subwoofer helps ensure that you still get the low end frequencies from your music and then some. We offer marine grade subwoofers that can withstand the elements from JL Audio, Rockford Fosgate, Kicker, Wet Sounds, and more. Like the speakers, most of the these marine grade subwoofers are designed for infinite baffle use, so you don't have to worry about a box. You can just mount the woofer directly to the hull of your boat. The best way to get great sound on your boat is to add an amplifier. Deck power just can't compare, literally and figuratively. We offer a wide range of marine amplifiers that are conformal coated and designed to withstand the elements. We offer marine grade amplifiers ranging from single channel, monoblock subwoofer amps, all the way up to 8 channel amplifiers from JL Audio and Kicker. Adding an amplifier to your boat's stereo system will allow your speakers to play louder, cleaner, and more clear for just overall better sound quality. Tower speakers. If you have a tower or bar to mount them to, just get 'em! We offer these ranging from 6.5" up to massive 11" horn tweeter tower speakers from Kicker. If you do any towing whether it be for wakeboarding, skiing, or tubing, give the person back there some tunes they can hear. 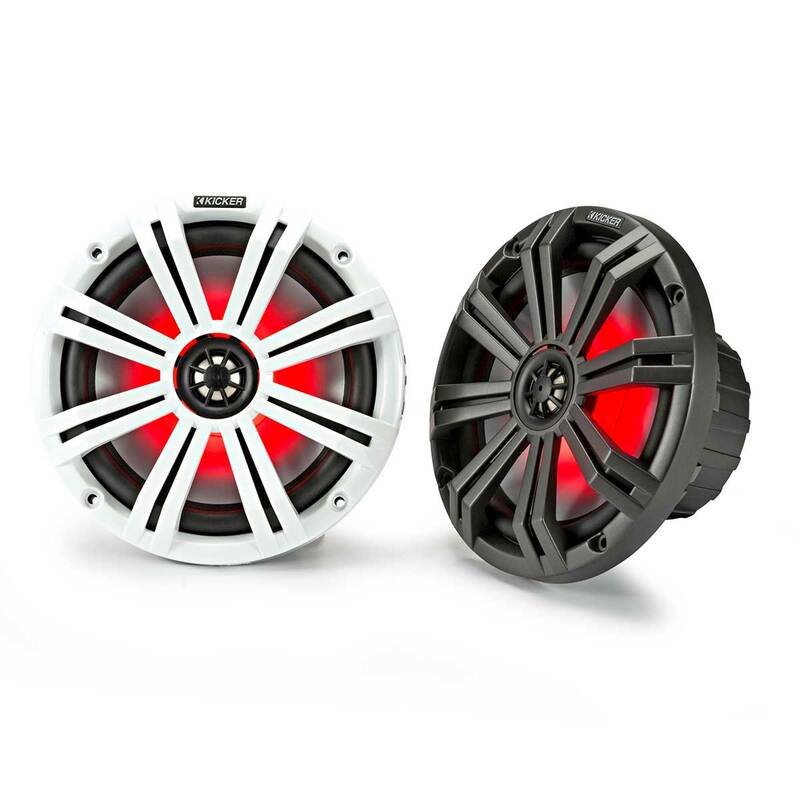 We offer wake tower speakers from Rockford Fosgate, JL Audio, Kicker and Wet Sounds. Rockford, Kicker and Wet Sounds have horn tweeter tower speakers that ear-drum melting loud. If you like to play your music loud and you like to part out on the water, add some tower speakers if you have a tower or a bar for mounting. You need something to control your music right? We offer simple, marine grade DIN size units with CD players, all the way up to multi-zone digital media receivers with multi-color, day-night screens. We carry marine source units from Boss, Kenwood, Rockford Fosgate, JL Audio, Kicker, Wet Sounds, and more. Just looking for something simple or looking to add Bluetooth? We offer several RCA bluetooth adapters that can plug into your existing head unit, or if you just wnat to stream music from your phone, you can connect them directly to an amplifier. In addition to the essential marine audio components, we also offer a wide range of accessories. This includes amp wiring kits, speaker grilles, LED subwoofer grilles, RGB LED controllers, equalizers, distribution blocks, and all of the other little odds and ends that will help make installation easier or, will make your marine stereo system just that much better.